Mid-week market update: Rob Hanna at Quantifiable Edges highlighted a historical study of what happens if the market pulls back after a persistent move to new highs, where yesterday (Tuesday) was day 0. If history is any guide, stock prices should grind higher over the next 10 days. Today was day 1 of that trading setup, and the market did not cooperate. The market's failure to rise despite statistical tailwinds is a sign that it faces some near-term turbulence. Class assignments for "Thinking Straight 101"
North Korea: George Friedman at Geopolitical Futures recently warned, "All the signs are there: The U.S. is telling North Korea, in no uncertain terms, that war is approaching." Discuss the probability of war. Small cap technology buy signal: Marketwatch recently highlighted Jonathan Krinsky's bullish outlook for small cap Technology stocks. Disentangle the source of potential alpha in the buy signal. China: While there has been much angst over China's crackdown on the shadow banking system, there is a school of thought that, no matter what happens, Beijing can take steps to avoid a hard landing. Discuss the consequences of socializing losses. Each of the stated positions have their own inherent contradictions. When will the market top out? Last week's post (see A market top checklist) generated many questions and much discussion. While there was general acceptance of my thesis that an intermediate top is not imminent, most of the questions revolved around how far away the market top is. As well, there were some queries about equity downside risk in the next bear market. I believe that those questions could be answered in a number of ways. Consider this chart from Jan Hatzius of Goldman Sachs that I showed several weeks ago (see Are the Fed and PBoC taking away the punch bowl?). 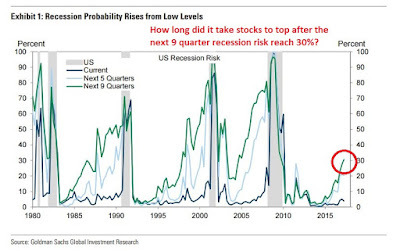 One reasonable approach might be, "Since major bear market episodes are caused by economic recessions, how far away were previous market tops when the 9 quarter recession risk reached 30%, which is the current reading today?" The answer is somewhat surprising, and a closer examination of the data shows that a simplistic application of historical studies can lead investors astray. In other words, history doesn't repeat itself, but rhymes. Mid-week market update: So far, my recent VIX based buy signal has worked out according to plan (see A market top checklist). I emailed subscribers the buy signal from the trading system on Friday, which was triggered when the VIX Index rises above its upper Bollinger Band and then mean reverts below. If history is any guide, stock prices should continue to grind upwards for the next couple of weeks. As the market tests resistance at all-time highs, further strength would imply a sustainable advance to further highs. However, an analysis of market breadth and sector leadership indicates the equity market faces a number of technical headwinds. Announcing our "Sale in May" event! 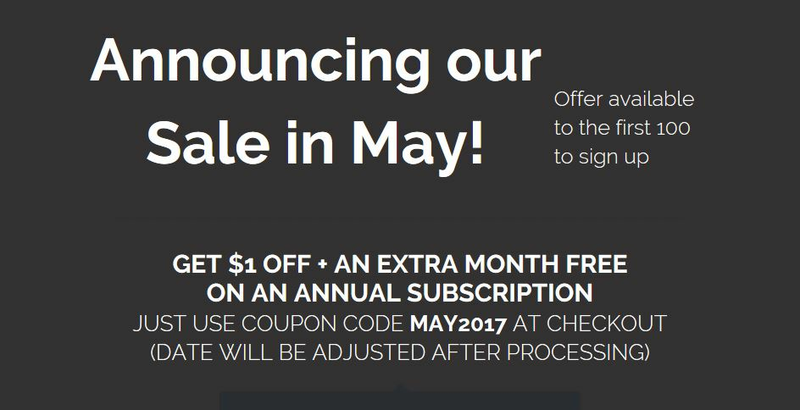 Get $1 off plus an extra month free off the first year of an annual subscription*. 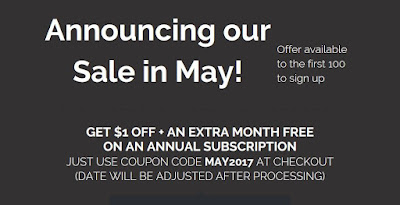 Use the coupon code May2017 at checkout. * Offer is only available to the first 100 to sign up and expires May 31, 2017. Subscription date extension will be made after order processing. (Chinese) blood in the streets? The worries about China ebbs and flows. The latest BAML Fund Manager Survey shows that China fears are at flood levels again. 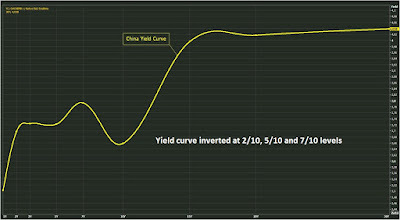 Indeed, developments such as the inverted Chinese yield curve is creating a sense of peak anxiety. I recently highlighted analysis indicating that China fears are overblown (see Are the Fed and PBoC taking away the punch bowl?). Bloomberg Asian economist Tom Orlik observed that, despite the crackdown on credit, there are no signs of an imminent downturn: "Credit is down but land sales and profits are up - businesses and local governments still have funds to work with." Investors should relax! The slowdown was policy induced, and policy can (and will) be reversed should the economy shudder, especially ahead of the 19th Party Congress later this year. China has suffered enough pain. It looks like its near-term outlook is turning up again. Late cycle = Market top? 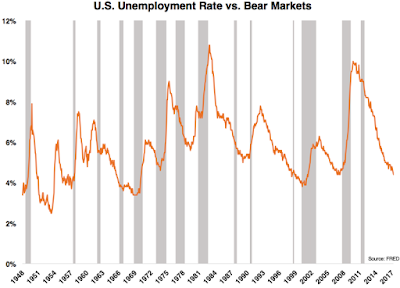 Ben Carlson recently published some research that related the unemployment rate to long-term equity returns. 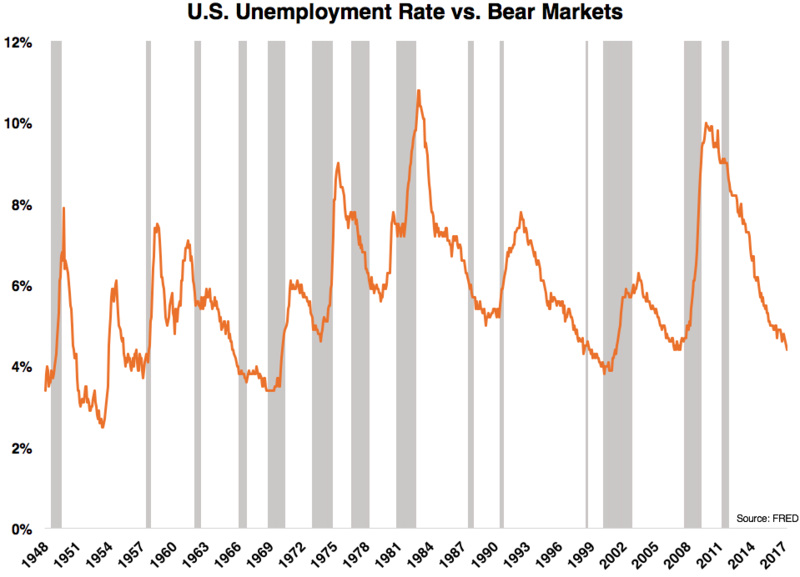 The current unemployment rate currently at 4.4% is indicative of a late cycle expansion and a possible signal of an impending bear market just around the corner. Carlson showed that it pays to buy stocks when unemployment is high (and therefore blood is running in the streets) and lighten up positions when they are low. 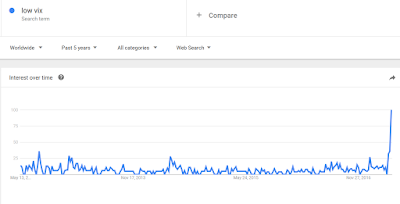 Sentiment: Is it getting frothy? Are silly deals getting done? Equity market internals: Are there signs of breadth deterioration, or defensive sector leadership? Credit market signals and monetary policy: What does the bond market tell us about growth expectations and credit conditions? Macroeconomic conditions: Is the US economy starting to falter? One of the characteristics of a good financial modeler is to know his model's limitations. He know how and why they work, and under what circumstances they will fail. 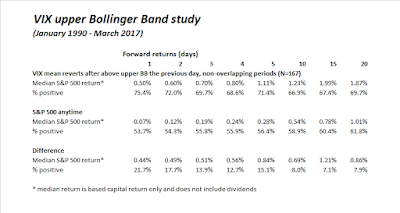 I have been asked a number of times in the past to disclose the returns of my trading account, or the signal dates of my trading model, whose out-of-sample buy and sell signals are shown below. I have resisted those requests because the disclosure of the data leads to a false level of precision in return that readers cannot expect. What and when do you buy and sell? How much do you buy and sell? How do you time the trade? The "arrows" in the above chart only answer question 1. The answer to the second question depends on the trader's personal circumstances. What is his risk tolerance, or pain threshold? What are the tax consequences of the trade? How much conviction does he have in the signal? Should he scale into a position? If the trade turns against him, how does he manage his risk, or should he average down? Conversely, should he take partial profits if the trade moves in his favor? I know nothing about my readers. I know nothing about the answers to any of the above questions. If I was a portfolio manager of an actual fund that uses this strategy, then there would be disclosure documents specifying the kinds of risks an investor can expect, as well as the tax implications of investing in the fund. Mid-week market update: The SPX rose to a marginal new high this week but broken down through a narrow range due to the latest he said-he said dispute in Washington. The index appears to have formed an island reversal with bearish implications. The market has fallen through two gaps to test its support level at about the 50 day moving average (dma). There are signs of complacency, which is contrarian bearish. Dealer positioning in derivatives could exacerbate downside risk. Political risk is nearing a breaking point that could affect the markets. Investor angst has been rising over the low level of the VIX Index. 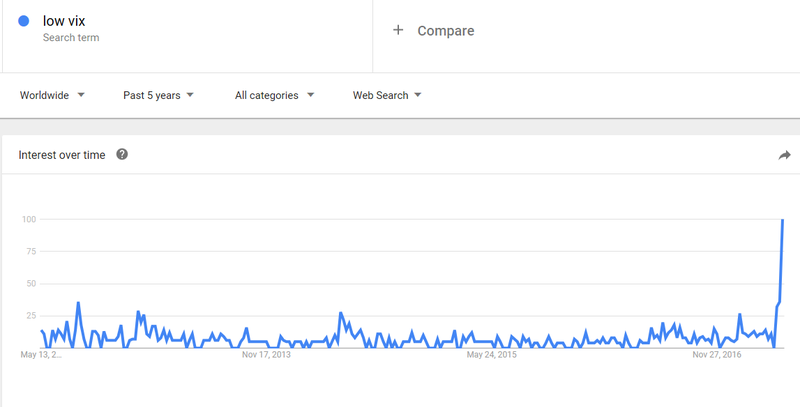 A simple glance at Google Trends tells the story of rising anxiety. The VIX Index fell to single digits last week, though it recovered to above 10 by the end of the week. 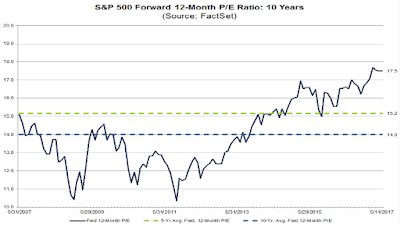 Nevertheless, current levels represent multi-year lows. 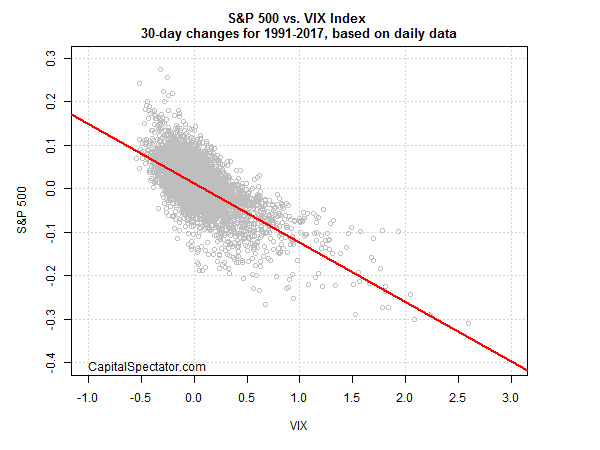 James Picerno at Capital Speculator demonstrated in the chart below that changes in the VIX are inversely correlated with stock prices. The combination of a low VIX and the inverse correlation has a lot of people questioning if a VIX spike could spark a rapid or disorderly equity market sell-off. In that case, why shouldn't the VIX, which is anticipated volatility, be low? To be sure, a low vol regime does carry its own risks. When vol does spike, it will catch a lot of investors and traders by surprise and has the potential to cause a lot of damage to asset prices. This bull market that began with the SPX low of 666 in March 2009 has lasted over eight years. While that may seem like a long time, bull markets don't just die of old age. Rather, they end as excesses build up and central bankers act to cool down the overheated economy. Today, there are numerous signs that this bull market is in its late stages. Valuations are elevated by virtually all measures. 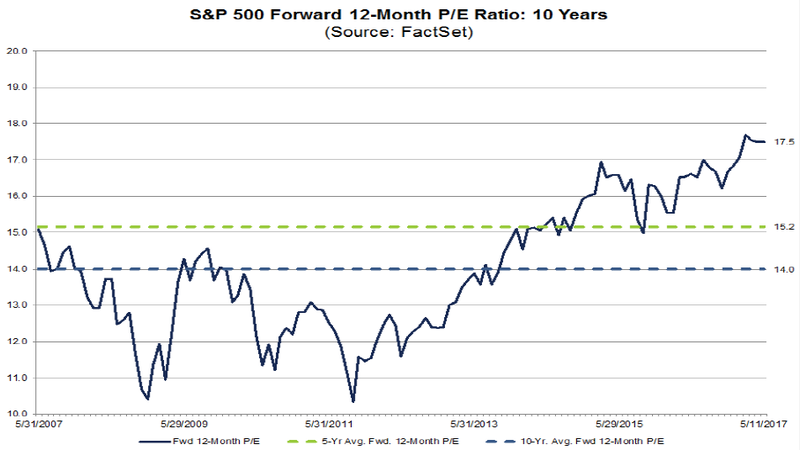 The chart of forward P/E from FactSet shows that current forward 12-month P/E ratio is well above historical norms. Sentiment is getting frothy. 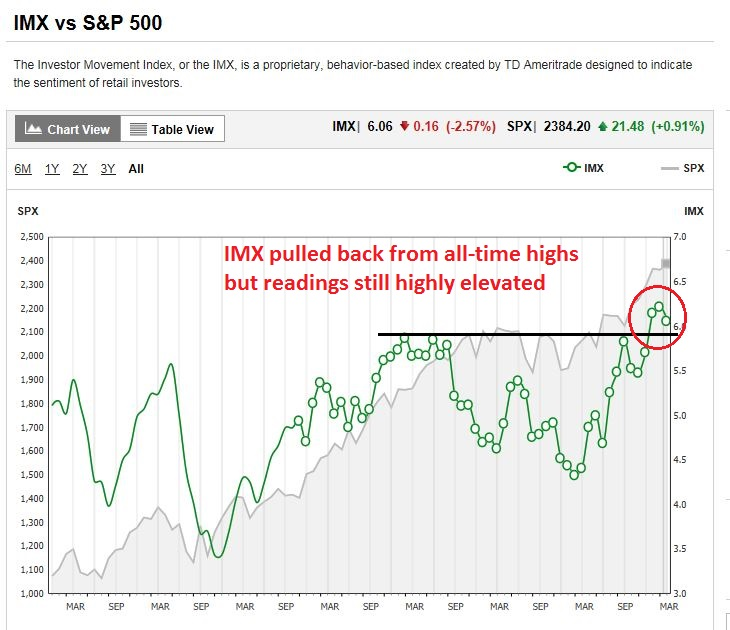 The TD-Ameritrade Investor Movement Index, or IMX, is designed to measure long-term retail investor sentiment. 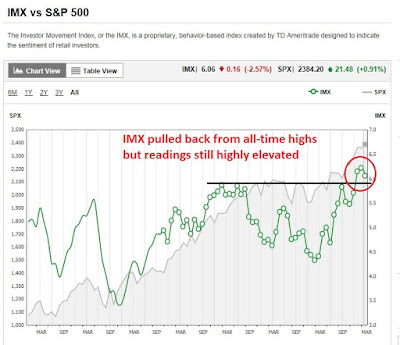 IMX hit an all-time high in March and pulled back in April. 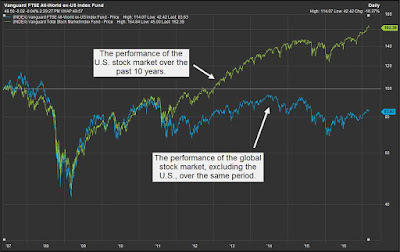 Readings are still very elevated by historical standards, indicating individual investor enthusiasm for stocks. So when does the next shoe drop? The most likely catalyst for a market top is central bank action to cool down the economy. Will a 0.25% hike crash the market? How about 0.50% this year, or Fed action to reduce the size of its balance sheet? In the past week, two key elections have been held that have important geopolitical, economic, and investment implications. First, remember this Time magazine cover? 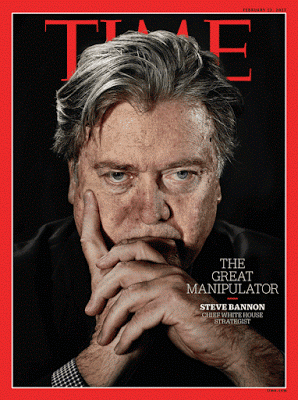 I indicated on February 6, 2017 that the cover may have marked Peak populism. I suggested at the time to buy France and sell Germany as a pairs trade. That trade has certainly worked out well. Now that Emmanuel Macron is destined to be the President of France, and Angela Merkel is the front runner to win another term as German Chancellor, challenges lie ahead for French-German cooperation in the eurozone. Macron has voiced his objective of greater European integration as part of his electoral platform, the question is, "How much integration is Germany willing to accept?" As well, I wrote on April 17, 2017 that the US had few good options in dealing with North Korea (see The Art of the Deal, North Korean edition). Now a further political development is certain to cause both Trump and the American foreign policy establishment headaches, namely the election of Moon Jae In as the President of South Korea. 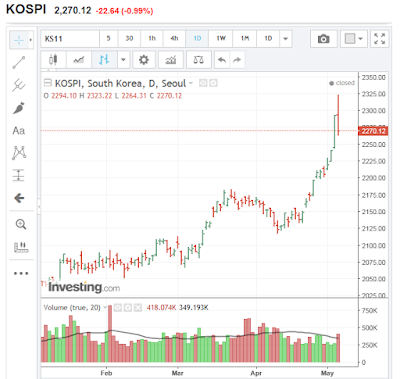 The South Korean KOSPI Index has rallied in the wake of this electoral result, but the likely loser in any geopolitical settlement engineered by Moon is the United States. Marketwatch recently featured a story indicating that investors should look to non-US equity markets for future gains, as valuations are far more compelling overseas. Not so fast! The story is more nuanced than that. The resolution of the situations in Europe and Korea have profound investment implications. As well, they have the potential to set the world on some very different paths for the next decade. 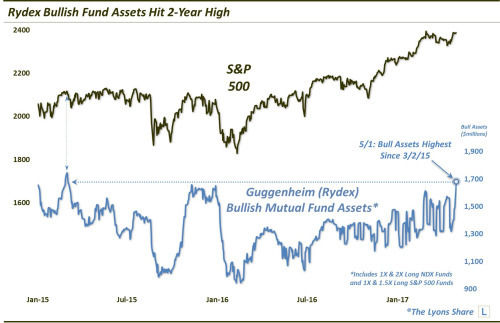 Rydex funds (now Guggenheim) were early pioneers in offering bull and bear funds, as well as to encouraging switching between bull and bear funds. This innovation attracted short-term traders who had previously been shunned by other mutual fund families. Consequently, Rydex fund assets became an important measure of short-term trader sentiment. Over the years, I have seen numerous analysts using Rydex data to support their investment conclusions. Most of it has been wrong. The latest came from Dana Lyons, whose conclusion I support, but it was based on the wrong methodology. Are the Fed and PBoC taking away the punch bowl? Tightening into an approaching storm? William McChesney Martin Jr., who was the longest serving Fed chair, famously said that the job of the Federal Reserve was to take away the punch bowl just as the party gets going. In the past week, there has been rising angst over two separate central bank actions that may indicate that the "punch bowl" is leaving the global party. The first set of actions belong to the Federal Reserve. The tone of the May FOMC statement and the strength of the April Employment Report makes a June rate hike a virtual certainty. Barring further "data sensitivity", the Fed is well on its way to raise rates three times in 2017, and to begin reducing its balance sheet either late this year or early next year. 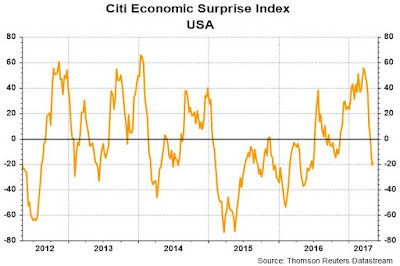 At the same time, the Citigroup US Economic Surprise Index, which measures whether macro releases are beating or missing expectations, has been tanking. These readings, along with the weak Q1 GDP growth figures, raise the risk of a Fed policy error as it tightens into a weakening economy. At about the same time, Beijing has been taking dramatic steps to contain credit growth and reduce leverage in China's shadow financial system. These liquidity tightening measures have caused commodity prices to collapse and create heightened market anxiety. Equity investors across the world are positioned for the nirvana of synchronised and accelerating global expansion led by China and the US. What they may instead get is a synchronised Sino-American slap in the face. Analysts at UBS say the international credit impulse has already "collapsed". The two interlocking economic superpowers are both tightening policy into an approaching storm. Meanwhile, the Fed is in "another galaxy", to borrow an expression in vogue this week. 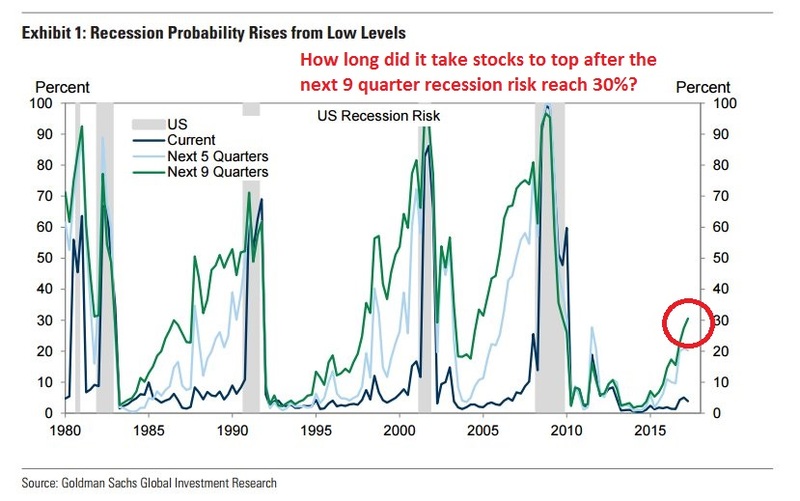 There must be a risk that they will do exactly what they did at the tail end of the pre-Lehman boom, when monetary indicators had already turned down. Bureaucratic over-tightening caused a manageable downturn to morph into a banking crash. 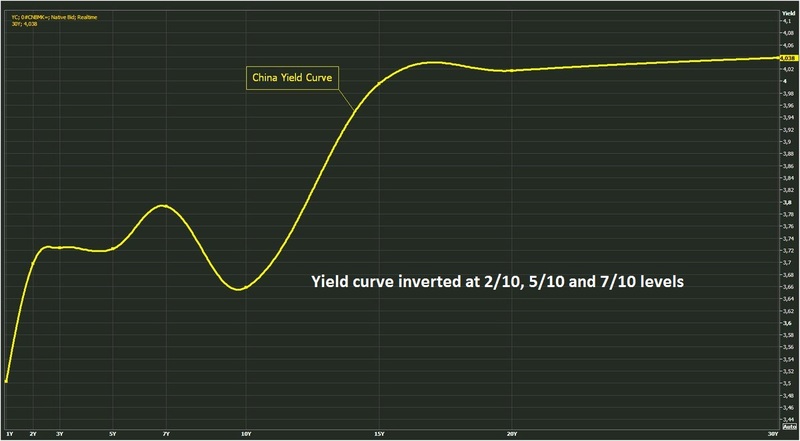 Beijing began stealth tightening six months ago. This is turning into a full-fledged effort to rein in the $US8 trillion shadow banking nexus. "The Chinese economy peaked in the first quarter and is set to lose steam for the rest of 2017," said Danske Bank. Caixin's manufacturing index is the weakest in seven months. Steel output has dropped to 2015 levels. Planned investment is even lower. Housing curbs are biting with a delay. China's credit impulse has turned negative. Saxo Bank says the contractionary forces are so powerful that the Chinese economy may slide towards a "full stop" later this year, with tremors through the commodity nexus and with risk of outright falls in world GDP. "The markets are pricing in a 20 per cent chance of a recession, but after returning from China, we think it is more like 60 per cent," said Saxo's Steen Jakobsen. Are the US and China tightening into a synchronized global recession? Let's examine the bull and bear cases. Mid-week market update: My recent sector review was well received, especially when it was framed in the context of how a market cycle rotation works (see In the 3rd inning of a market cycle advance). As I don't have much to update about the technical condition of the stock market, especially in light of the non-reaction to the FOMC meeting. The SPX remains in a tight trading range between 2380 and 2400. Under those circumstancees, I thought that I would focus on a popular topic with a number of readers, gold. In particular, gold is important in a market cycle analytical framework. That's because inflation hedge leadership tends to mark the terminal phase of equity bull cycle. Technically, gold prices may be nearing an inflection point. 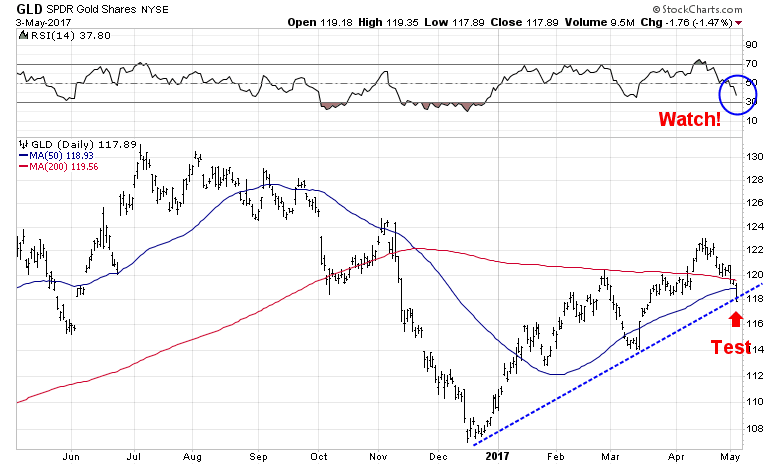 As the chart below shows, gold violated its 50 and 200 day moving averages (dma) and it is now testing an uptrend line. Further weakness would be bad news for the bulls. However, keep a close eye on the RSI reading (top panel). Charlie Bilello pointed out that gold is oversold, as defined by its RSI below 30, gold prices has historically performed well. Callum Thomas of Topdown Charts observed that gold prices tend to be inversely correlated with the shadow Fed Funds rate. The Fed continuing tightening cycle should be bearish for gold. Indeed, the historical record shows that gold prices (blue lines) are inversely correlated with real interest rates (red line, inverted scale). 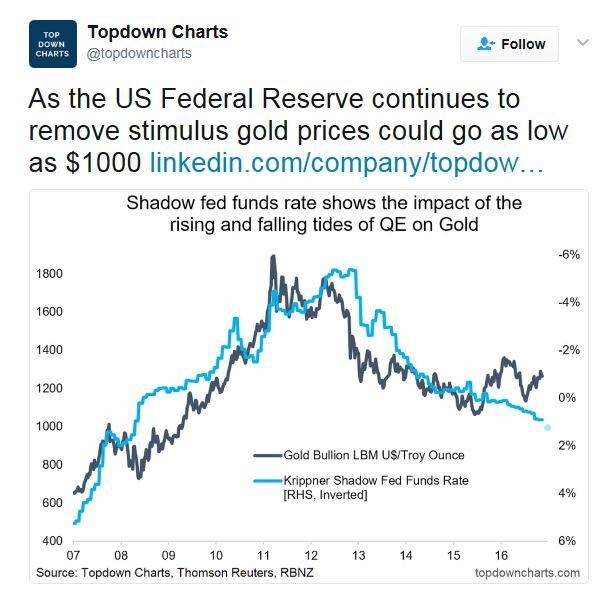 Gold is an inflation hedge, and rising real interest rates would tend to depress the price of gold. 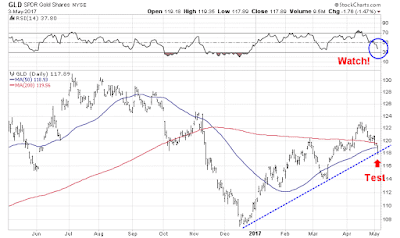 Should investors and traders be bullish or bearish on gold? Rather than try and debate the likely path of inflation and interest rates, an analysis of the technical conditions of other inflation hedge vehicles such as energy and mining represents a more pragmatic approach to the problem. You may think that institutional money managers run in herds, but that is not necessarily true. Different managers have different mandates that color their views. As well, their geographical base can also create differences in opinions in how their view their world and markets. Barron's published its quarterly Big Money poll of institutional money managers on the weekend. The Barron's survey sample consists of US based managers. Another well known poll, the BAML Fund Manager Survey, is published monthly and surveys global institutions. A comparison of these two polls gives us a chance to find some opportunities and risks in the market. The US equity market comprise roughly half the weight of global equity indices, and the opinions of American managers are undoubtedly important. By contrast, the BAML sample also survey shows the views of non-US managers whose opinions can, on occasion, reveal key differences. By analyzing the degree of agreement, astute investors can find opportunities, as well as understand the blind spots of each group. First of all, there was some remarkable agreement in the opinions of both groups. Both are bullish on equities. 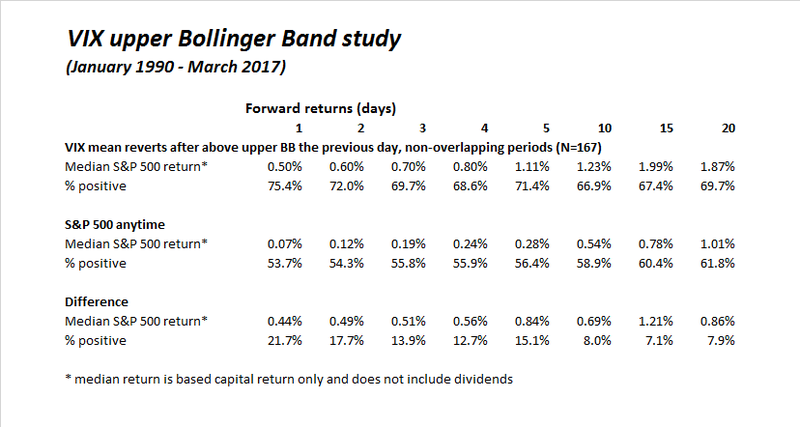 The Big Money poll showed a clear progression on equity bullishness. Similarly, the BAML sample showed a similar rising level of bullishness. Normally, a bullish stampede would set off contrarian warnings of caution. 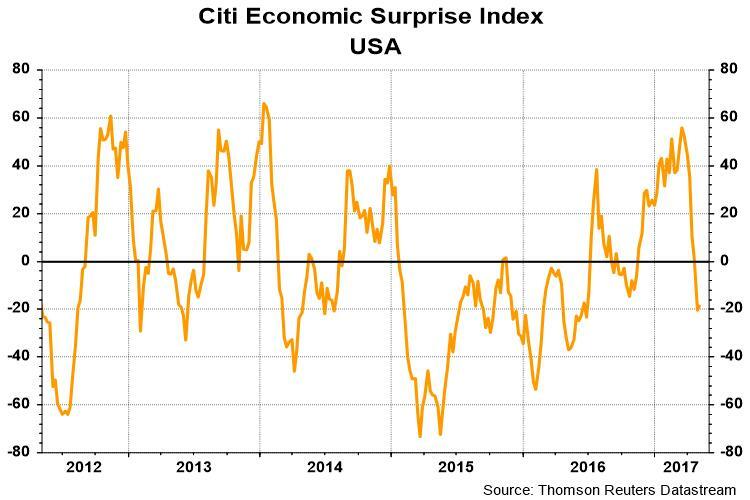 However, as the chart below shows, sentiment rose in the last year from relatively low levels and they are not excessively high. Therefore it is probably too early to get cautious just yet.